V. S. Naipaul’s novel of fraudulent revolution, schizophrenia and murder. Set on a troubled Caribbean island – where Asians, Africans, Americans and former British colonials co-exist in a state of suppressed hysteria – Guerrillas is a novel of colonialism and revolution. A white man arrives with his mistress, an Englishwoman influenced by fantasies of native power and sexuality, unaware of the consequences of her actions. Together with a leader of the ‘revolution’, they act out a gripping drama of death, sexual violence and spiritual impotence. 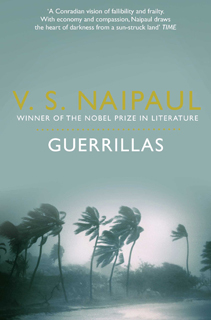 Guerrillas depicts a convulsion in public life, and ends in private violence. The novel comes with extraordinary force from the centre of a profound moral awareness of the world’s plight.